Screencap from Ara Mina’s Twitter account. 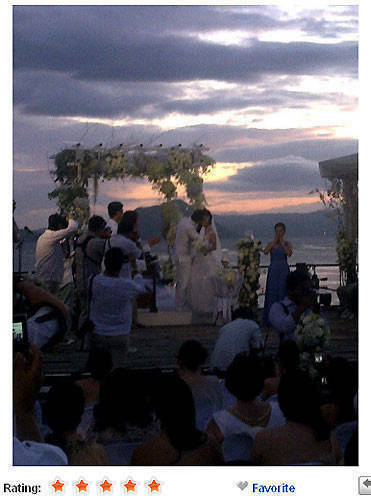 She Tweeted, "You may kiss the bride weeeeee...."
Actors Kristine Hermosa and Oyo Boy Sotto got married yesterday at Club Balay Isabel in Batangas, reports ABS-CBNNews.com. The couple’s relatives and close friends, including actresses Ara Mina and Maricar de Mesa, attended the Christian ceremony. ABS-CBN President Charo Santos-Concio and Star Magic Head Johnny Manahan were two of the principal sponsors. Hermosa and Sotto first met on the set of Enteng Kabisote in 2004, and Sotto confirmed rumors of their relationship in September 2009, according to ABS-CBNNews.com. Hermosa was previously married to actor Diether Ocampo.